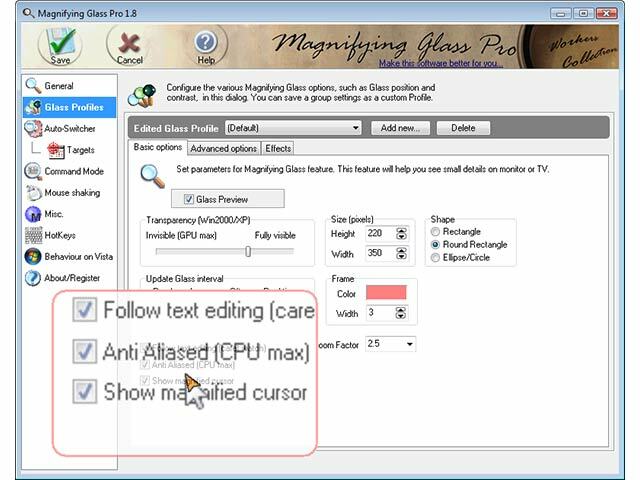 Magnifying Glass Pro is a flexible full screen zoom-utility that magnifies portions of the screen under your mouse cursor or caret. A magnifier is useful to designers, engineers, visually impaired users, PC-to-TV connections, multi-monitor systems. Magnifying Glass Pro contains a unique set of features: many visual options, auto-change Glass settings upon application detection, easy-to-control Glass with on-screen HUD. Platforms: Win 9x/2000/XP. ...... In addition, you can apply a variety of visual effects and enhancements to that display. What can "Magnifying Glass Pro" do for you? *Lessen eyestrain for those with normal vision. *Enhance onscreen and projected detail. *Allow modification of the magnified area in real time (e.g., invert or rotate the image, change the contrast). *Take advantage of multi-monitor systems. For example, one monitor (or TV screen) could be dedicated to a full-screen Glass -- a magnified, easy-to-view display of the image on the primary working display. *Provide you with more control over your business presentations. *Modification of an onscreen image in real time (e.g., adjust contrast, add special effects, smoothing, and so on). *Adjust the screen position of the magnifying Glass (e.g., a fixed position, under the cursor, angular, and so on). Qweas is providing links to Magnifying Glass Pro 1.9 as a courtesy, and makes no representations regarding Magnifying Glass Pro or any other applications or any information related thereto. Any questions, complaints or claims regarding this application Magnifying Glass Pro 1.9 must be directed to the appropriate software vendor. You may click the publisher link of Magnifying Glass Pro on the top of this page to get more details about the vendor.